"Selden paused in surprise. In the afternoon rush of the Grand Central Station his eyes had been refreshed by the sight of Miss Lily Bart." So begins Edith Wharton's, The House of Mirth filled with complexities about society at that time. Instantly, the exquisite beauty of Miss Lily Bart amazed me and I found I could read about her for hours. Through all of her vanity, frailties and ambition I just enjoyed her character which I couldn't help but smile about her intellect or actions at times. I also liked Selden and his joyful personality. Finally, Mr. Rosedale grew my intrigue as the story progressed and eventually some respect toward him by the end of the book when he offered to help Miss Bart in her troubling situation. Although, at first, I had a hard time getting into the book or even understanding the unique language of the book. As I continued reading it, the details eventually captured me. 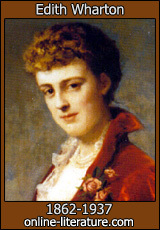 Here is an example of that detail in this paragraph of Miss Lily from the perspective of Mr. Rosedale: "As she leaned back before him, her lids drooping in utter lassitude, though the first warm draught already tinged her face with returning life, Rosedale was seized afresh by the poignant surprise of her beauty. The dark pencilling of fatigue under her eyes, the morbid blue-veined pallour of the temples, brought out the brightness of her hair and lips, as though all her ebbing vitality were centred there. Against the dull chocolate-coloured background of the restaurant, the purity of her head stood out as it had never done in the most brightly-lit ball-room. He looked at her with a startled uncomfortable feeling, as though her beauty were a forgotten enemy that had lain in ambush and now sprang out on him unawares." Overall, I enjoyed this book very much. On a grade scale I would rate it an A- and I would recommend this book for others to read. At the Classic Literature Book Group I attend at the library, it was recommended there as a good first read for someone who would like to be exposed to classic literature. I'm also glad you enjoyed the book. I agree, the language is difficult to get into. Oooo. Just reading the extract is rough for me. By the time I get to the end of the sentence, I've forgotten what the beginning said. Terry, if that sentence got to you, don't read this book. Seriously. Every sentence is exactly like that. i tried to read Paradise Lost once. made it through 2 sentences and gave up. the embarassing thing is my son read (and enjoyed) PL when he was in High School.